My heart changed my mind. Sometimes, my life does not move in a linear fashion. Sometimes, my blog posts jump back and forth across time lines. Sometimes, I make plans but my heart changes my mind. My last post was of losing my good friend and four-legged companion, Misty. This post speaks of things before and after that. 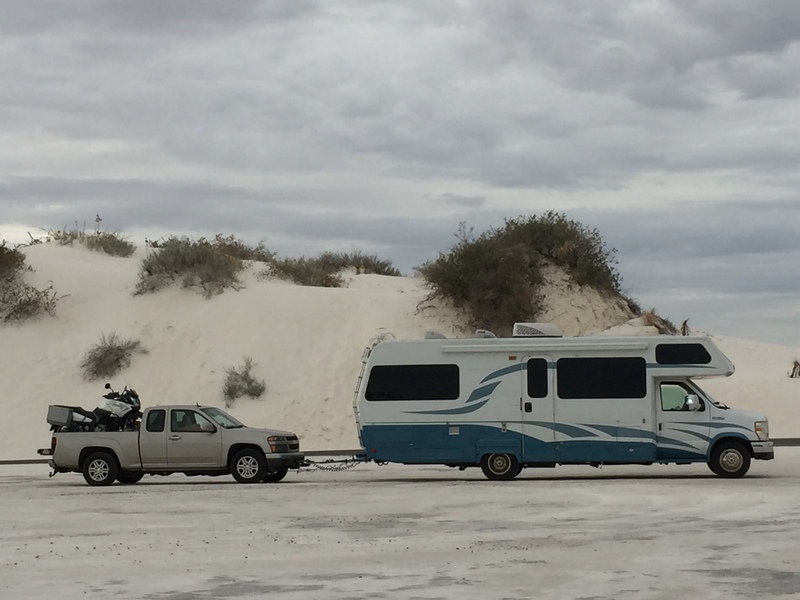 After finishing the Habitat build in Las Cruces, NM, on November 12, 2017, Misty and I took the motorhome north to Elephant Butte State Park, near Truth or Consequences, NM. 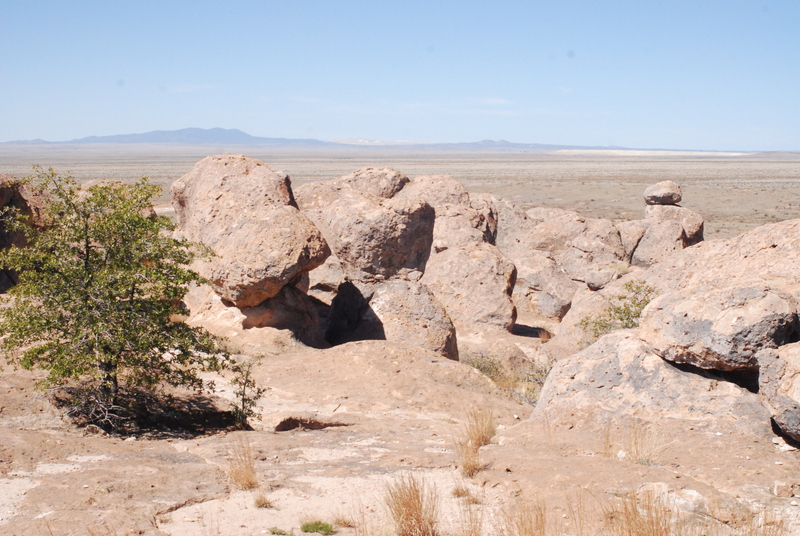 Within the NM State Park system, you can stay in a park for two weeks, but then you have to leave; you can go to another state park, and come back to that particular park a week later. This generates an interesting cross current of RV’ers moving around on two week schedules and creates a subculture of gypsy friends. At Elephant Butte I became friends with Mary, a free-wheeling single female who pulls a large toy hauler with her diesel truck. She rides a Harley and rides it well. Mary and I rode our bikes over to Hatch, NM – home of the famous Hatch chilies. I smiled at the spicy smell of red peppers in the fields. I’m familiar with what you can smell on a motorcycle in Northwest Florida and South Alabama – peanut dust at harvest time, red clay recently plowed, pines after a heavy rain, and salty Gulf air. And then there are universal smells – meat on an unseen BBQ grill, a wood fire, freshly mowed grass, burned rubber, dead skunk. In Hatch, I added fields of red chili peppers to my two-wheel olfactory encyclopedia. 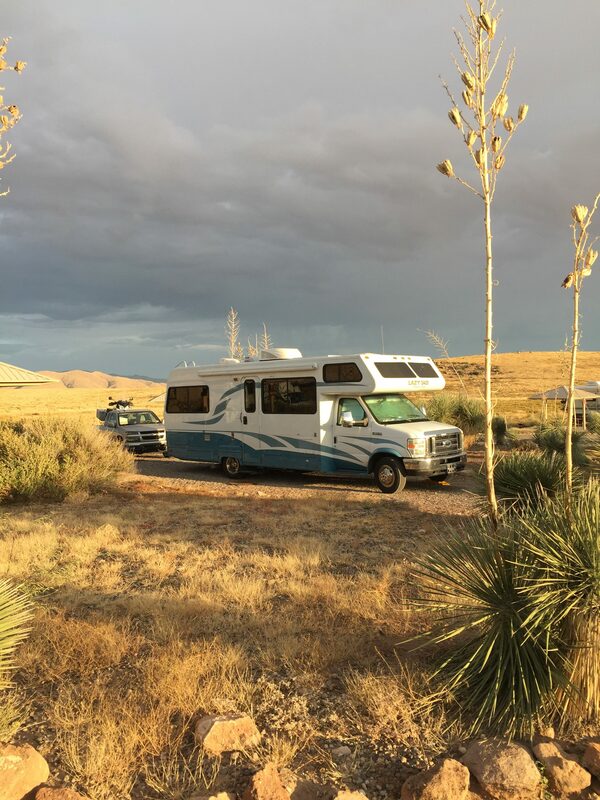 After two weeks at Elephant Butte State Park, I loaded the motorcycle into the bed of my truck, hooked the truck to the rear of the motorhome, and Misty and I drove over to City of Rocks, our favorite NM State Park – the place I found and lost Misty. See my blog post 16. Mysteries of Misty for that story. And at City of Rocks, I crossed paths with Mary and two other RV’ers I’d met at Elephant Butte. People wonder if I’m lonely, traveling alone. The reality is – there is an amazing community of RV’ers out there – friendly, helpful, and adventuresome. 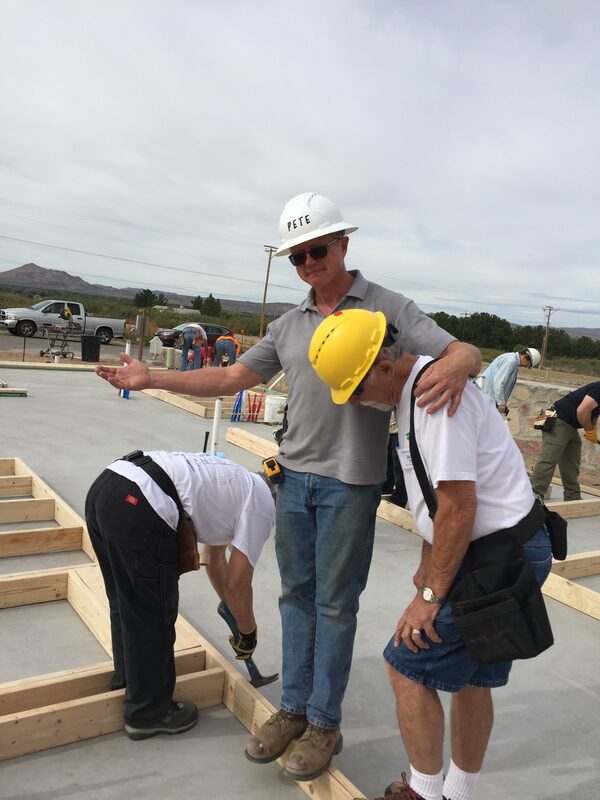 At the Habitat build in Las Cruces, I became friends with Dyana, another fulltime solo female RV’er. On Monday after I lost Misty on Friday, I met Dyana in Deming, NM, (about 30 miles south of City of Rocks), and we had lunch at the Adobe Deli, an eclectic place in the middle of nowhere that was once an old school and now slightly resembles a weird museum with strange antiques and stuffed/dead animals perched in every corner, ledge, and open space, watching with glassy eyes as we ate startlingly good food. From Adobe Deli, we took a short ride south to cross the Mexican border into Palomas to shop at the Pink Store (they serve you free margaritas while you browse through a little bit of most anything Mexican that’s colorful, beautiful, and unique.) 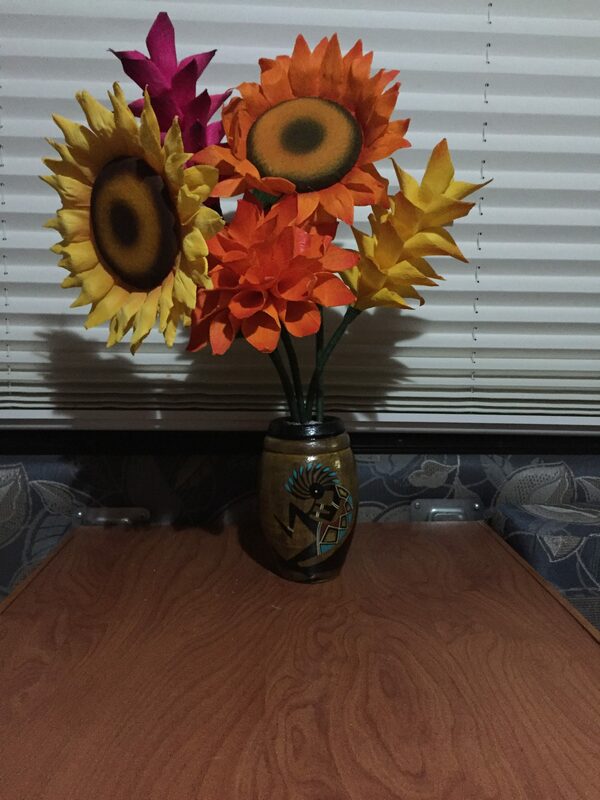 With Dyana’s encouragement and prodding laughter, I came back with a bouquet of brightly colored paper flowers for the too clean motorhome, because the flowers make me smile – and a black ceramic Day of the Dead tile of a happy dead dog, because it makes me laugh out loud. I’m reminded that Misty is a happy dead dog – after eating serial last meals, stalking the rabbits, hearing the coyotes sing, and smelling every bone in Pet Smart. I didn’t put my needs first and wait too long to deal responsibly with her new reality. Misty was not yet in pain. And her memories are outlasting my pain. After two weeks at City of Rocks, I drove through the desert alone, with colorful flowers and a black ceramic tile of a happy dead dog. When I get Misty’s ashes, I’ll bring them back to City of Rocks. 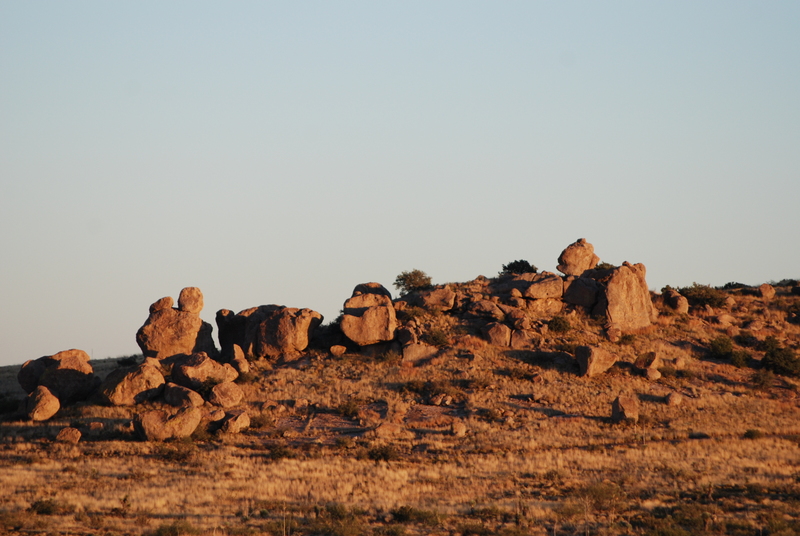 But for now, I was heading west to an RV park in Benson, AZ (near I-10 and the New Mexico/Arizona border). 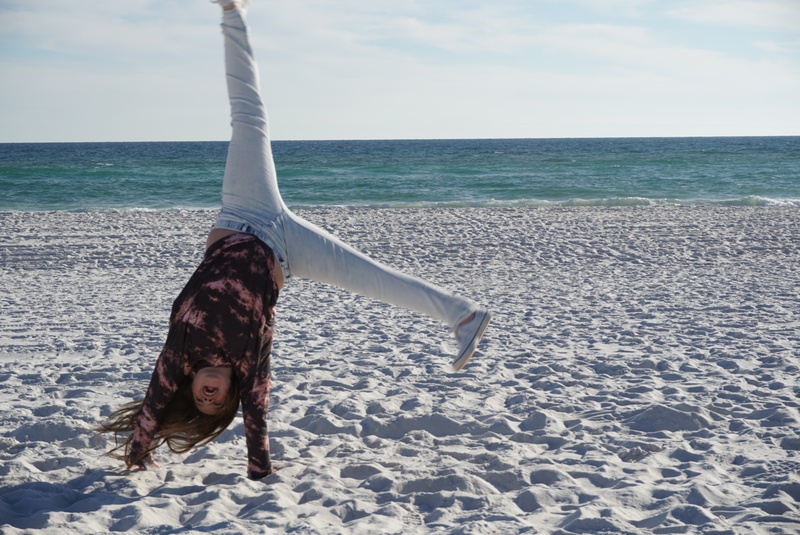 Over the summer I’d discussed my travel plans with my granddaughter; I explained I couldn’t make two trips from Arizona to Florida and asked if she wanted me to be there for her September birthday or Christmas. She emphatically chose September. So, I was in Florida for her birthday and then drove the motorhome back West in October. 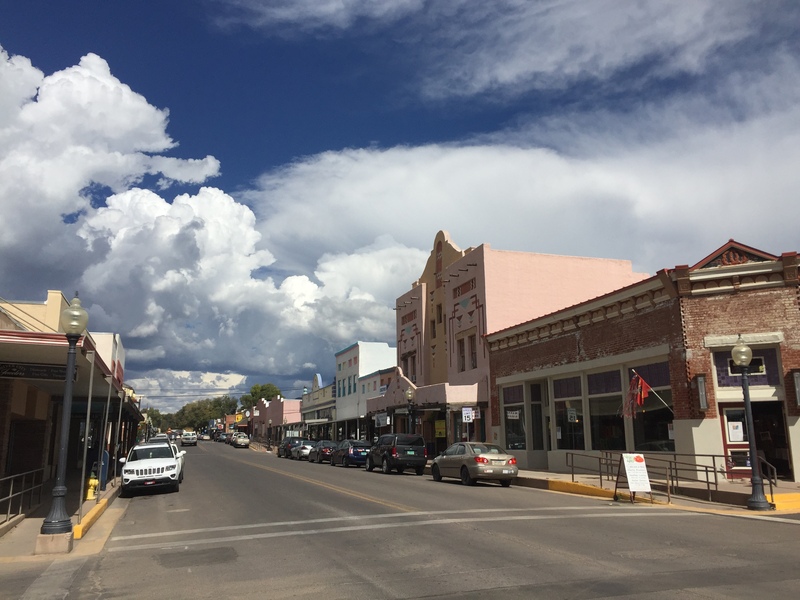 I had rough plans to return to Florida in the Spring; I’d spend Christmas with friends in Benson, AZ. But we’d made those plans in the summer and I left Florida in October. This was December! To an eleven-year old, the world changes quickly. I checked into the RV park in Benson, AZ, on December 5 and paid for a month. On December 8 I was comfortably seated in my motorhome in the desert, Face Timing with my granddaughter, when she said, matter of factly, “Did you realize that if you were here on December 18, you could hear my Christmas choral program?” I laughed. And by the time the sun came up in the desert, my heart had changed my mind. My mind had no choice except to rationalize what was coming next. I put the motorhome in storage in Benson and drove the truck back to Florida. And I learned that 1,600 miles in three days is too far, too fast, especially in a small, light-weight pickup. But I got back in time to see my granddaughter’s Christmas program on December 18. On Christmas Eve, we went to Peg Leg Pete’s on Pensacola Beach for incredible seafood. Everyone ordered something different and then shared. After much great Mexican food in the desert, at the beach I shamelessly gorged myself on fresh seafood – raw oysters, oysters Rockefeller, steamed shrimp and crab legs, fried shrimp and fried oysters. 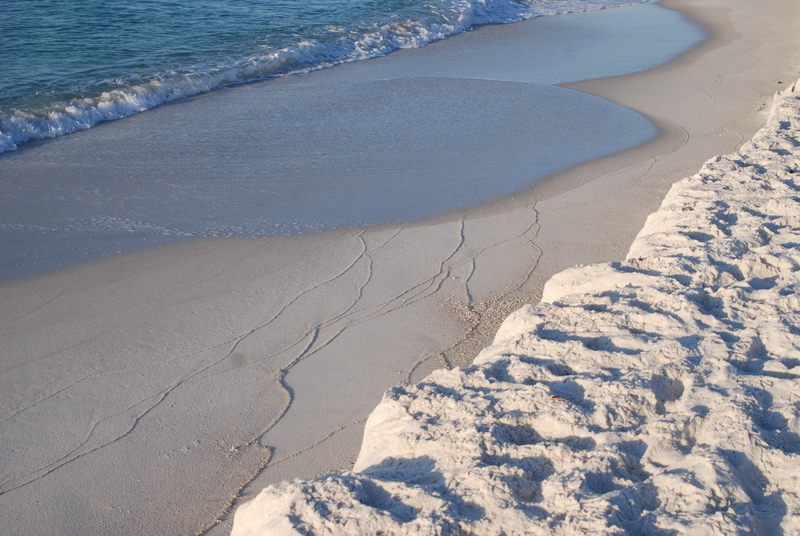 Then we waddled across to the Gulf and played on the sugar-white beach. And now? I’ll head west soon. The high desert is calling, and my mind is scrambling to justify the many miles between here and there. The simple rationalization is – I left the motorhome in storage, and the rent is due January 11. 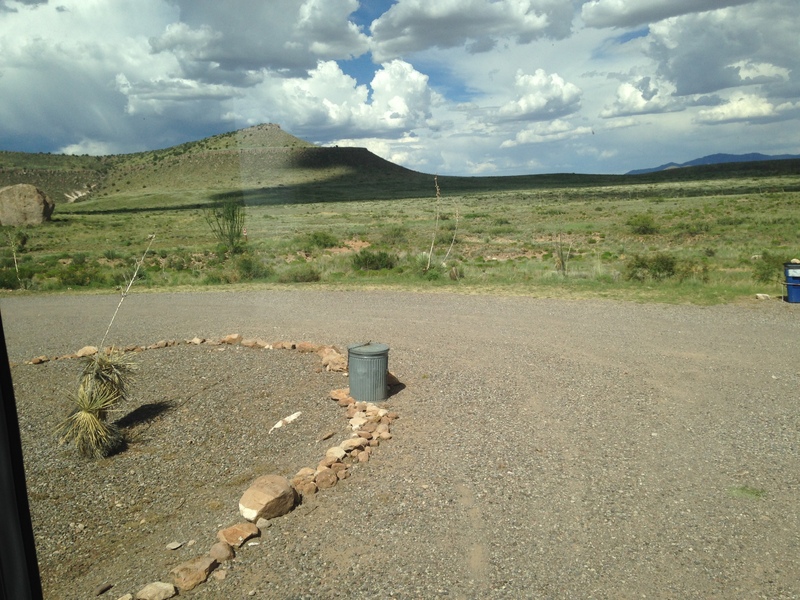 In July of 2015 I parked my RV at City of Rocks State Park in western NM; in the adjoining lot was a van. The woman was outside cooking on a hot plate (they lived in the van), and a beautiful black and tan German Shepherd lay quietly at her feet. As I began to unhook my travel trailer and settle in, I spoke to the woman and of course complimented her on her Shepherd. Within five minutes, she offered to give Misty to me. I’m a startled believer in such chance encounters. I’ve had Shepherds most of my life; each one showed up uninvited. They graced me with years of companionship, and then in failing health required that I make the agonizing decision to put them down. I’d lost my last Shepherd two years earlier. The lady in the van first explained that her husband was very ill, was going into hospice, and she couldn’t take care of him and Misty, and that he only had two weeks left. We agreed that Misty could stay with me for the next four days, and we’d see how it worked. I stressed they could change their minds, but that I had to leave in four days. They explained they’d had Misty since she was a puppy and that she would be 11 years old in December, 2015. That was hard to believe, as fit and spry as she was. The wife spent a lot of time in my rig over the next few days (I lived in a 32 foot travel trailer with two slides; they lived in a black van.) The following morning she said, “I’m the world’s worst liar. Greg is sick but he doesn’t want to go into hospice. So he’s going to kill himself.” After 10 years as a trial lawyer followed by 10 years as a judge I’ve developed a good poker face. I said nothing but thought, “Easy, Laura. You don’t know his situation or how you would handle it.” But then she added “And I’m going with him. I can’t bear living alone.” It was harder to keep a bland face with that comment. To put it mildly, I didn’t know how to deal with all of that, nor did I know what to believe. They were giving me the creeps, and I wanted to just run away, with Misty, in the middle of the night. But I’d told them I’d leave on Friday, and I very much wanted this particular black and tan, now sleeping on my couch, to be safe. I knew from my days as a judge, that if I called law enforcement, the couple could readily discount any concern that they were a “threat to themselves or others”, and I would only succeed in “flushing” them – and they’d leave WITH Misty, to do whatever they chose. I called a retired Methodist minister; I talked with a friend who is a psychiatrist. I had long candid conversations with the wife. And Misty stayed with me, on a trial run, until Friday, my set departure date. Finally Friday arrived; filled with dread and confusion I took Misty outside and told Greg, “Here. Misty is yours.” I had spent sleepless nights, bracing for whatever weird story would come next. Yet the Husband replied, “No, Misty is yours.” The wife hugged my neck and said, “You’re an answer to our prayers,” The two of them left on a long walk; I hooked up the RV. Misty and I drove away. I haven’t seen or heard from them since. A year and a half after I began traveling with Misty, I had a medical issue at the age of 69 for which my cardiologist recommended a service dog. I wasn’t interested in buying a service dog; one German Shepherd in a 27.5 foot motorhome was enough. 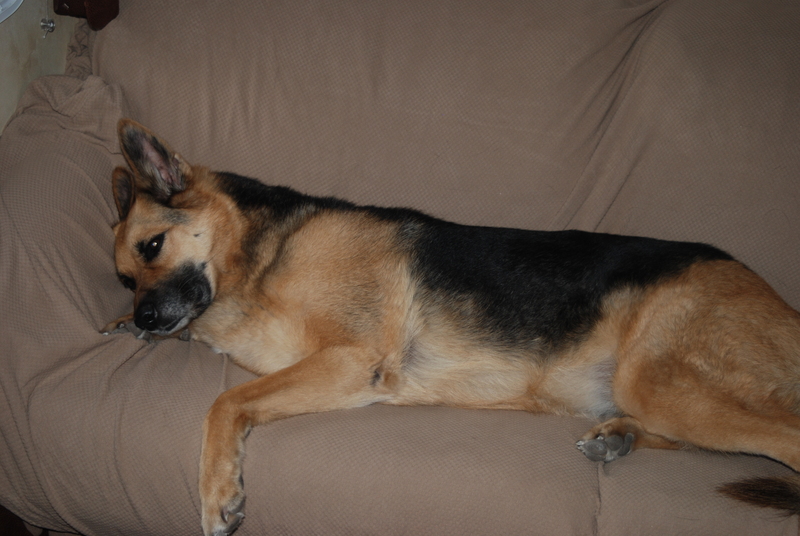 Misty was the smartest Shepherd I’ve had and in good physical health. I contacted a service dog training school in Tucson, AZ. Though Misty was “too old” to go through the school (four years is their cut off age), they referred me to one of their trainers and we went to work, after hours. Misty took to service work in ways that startled both me and the trainer. She had an unflappable demeanor, was very bright, and totally food motivated. I swear she would have done a double back flip for a treat, if I could help her understand what I wanted. In the first of many adaptions that will be required as I age, I also traded in my 32 travel trailer and big diesel truck for a small motorhome with no slides and a miniature truck to tow behind. I call it my little old lady motorhome. Between her good looks and calm demeanor, Misty was the poster child of good will. She was particularly fond of children, and gently let tiny strangers pet and poke. Misty also had a way of knowing when a grown-up needed a special dog fix. One day when we came out of Wal-Mart (she was on-duty, wearing her superwoman red cape that read “in training”), she stopped as we approached a man standing between the parked cars. He spoke quietly, “I had a German Shepherd.” I responded, “Yeah, they’re great dogs,” and took a step. Misty didn’t move. I paused, a bit confused by Misty, for her whole focus was on the man. She wasn’t tensed, just intense. He said, “My dog was looked just like her.” I trusted Misty and her instincts; I said, “Free” and she moved to him. He buried his hands in her fur and dropped his head. Then he added,” I had to put my dog down last week.” His wife was standing behind him; she caught my eye and quietly mouthed “Thank you.” After a few quiet moments, he stood up and walked away. Though Misty remained alert and so very good looking, in August, 2017, she began having trouble with her hips (a common problem for German Shepherds). The vet said it was arthritis and we began an extensive (and expensive) Rx regime. When we left NW Florida in the motorhome early October, she was fine though still not back at the top of her game. 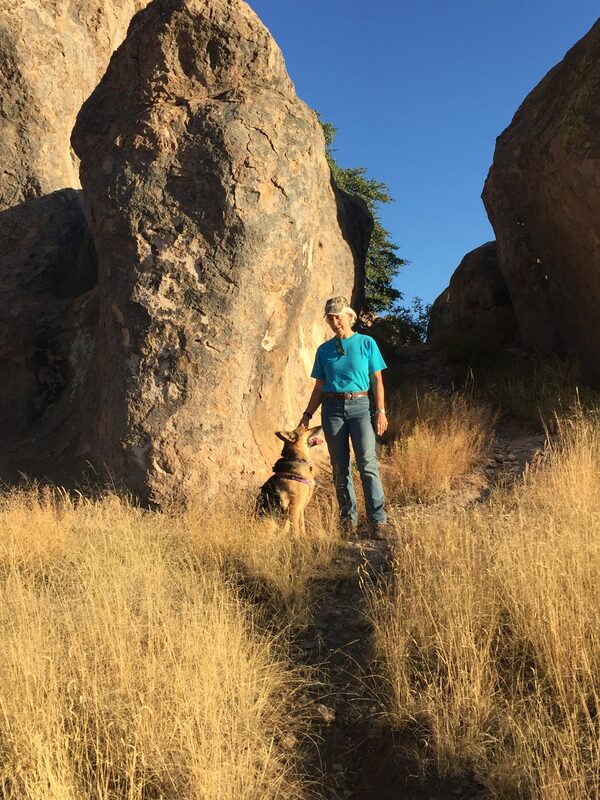 By early November, we were back at City of Rocks SP in western NM – a place we both loved, and the place she had first come to me. November 3, I took Misty to East Lohman Veterinary Clinic in Las Cruces, NM, for her monthly Adequan injection; she was slowing down but still in control of her world. But when we went to Albuquerque to visit friends for Thanksgiving, she drug her left rear foot on the sidewalks to the point the toe nails bled, a lot. I dialed back her activity level even more but she was soon dragging both rear feet; she couldn’t tell where her hind legs were, so they would get tangled up or slide out from under her at weird angles. She was noticeably worst when we left Albuquerque. I didn’t want to take her to a stranger, though Dr. Ross was certainly not the closest vet. It was only miles, so I made another appointment in Las Cruces for November 30. We were back at City of Rocks and drove into town early to meet friends for lunch at Rudy’s, a popular BBQ place in Las Cruces. Misty came in with me, wearing her superwoman cape that says “In Training.” She lay on the floor of olfactory heaven and took a pill wrapped in my roasted turkey breast. Again, people bragged on her – how pretty, how smart, how calm. But the BBQ was hard for me to swallow. Misty and I drove back to City of Rocks State Park, and the bad jokes began. I asked what she wanted for her Last Supper; we agreed on lots of rotisserie chicken and home-made chicken soup on top of a little kibble. Our only goal was to insure she didn’t get an upset stomach. She wondered why we hadn’t started this Last Supper routine months ago. Friday morning she happily inhaled her Last Breakfast – a repeat of the menu from the night before. Then just after sunrise, we took the Last Walk, up through the rocks. Her ears were on full alert; the adrenalin was flowing as she hurried hither and yon, pulling on the leash, convinced she could catch those darting rabbits if I’d just turn her loose. As we turned to go back to the RV, a pack of coyotes began to sing. Misty’s coyote angels, calling her home. Then we got in the truck and headed back to Las Cruces. I’d packed her a Last Picnic of yet more rotisserie chicken and we left early to stop at a city park near the vet. But as I made the turn, there on the corner was a Pet Smart! Misty’s all-time favorite place. So we skipped the park and went to Pet Smart. Misty walked up and down the aisles, smelling every bone and bag of dog food within nose reach. Twice. But then it was time to go. At the vet’s office, Misty and I were led into a room with a soft blanket on the floor, and I began to parcel out yet more rotisserie chicken. As I sat on the floor beside her, Dr. Ross gave her a shot that relaxed her and then injected the lethal dose in her artery. The process is …. 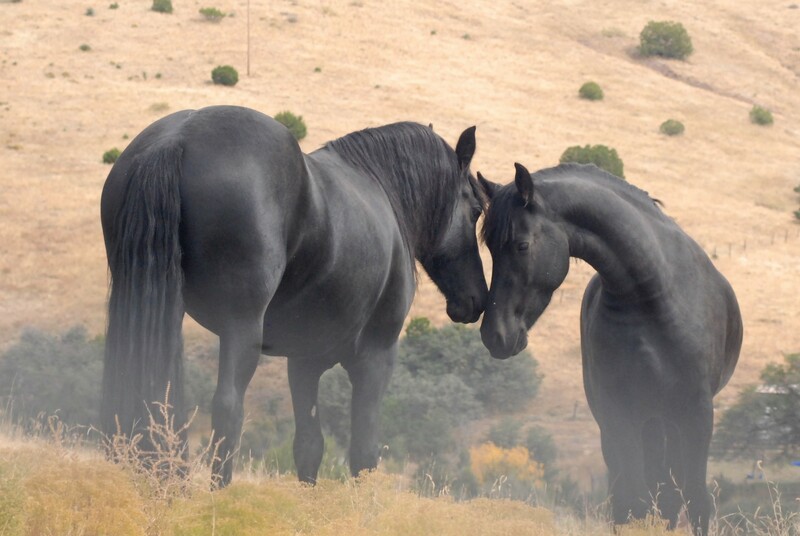 more than words can convey. Soon the vet nodded and said, “She’s gone. You can stay as long as you like.” I got up, shaking my head and responded, “No. I have to go now.” Then I leaned over and buried my hand in her still warm fur and looked straight into the vet’s eyes, “You won’t find a better one than this.” I left through the back door and sat in my truck until the sobs subsided enough I could see and drive. Back at the RV, I began to clean house. The next day, I took laundry – mine and Misty’s – to the Laundromat. I came home to an RV that was too clean, too quiet, too empty. Two days later I went with Dyana, a friend from Las Cruces, to the Pink Store in Palomas, Mexico. I bought very large, very bright paper flowers and a vase, because they make me smile. 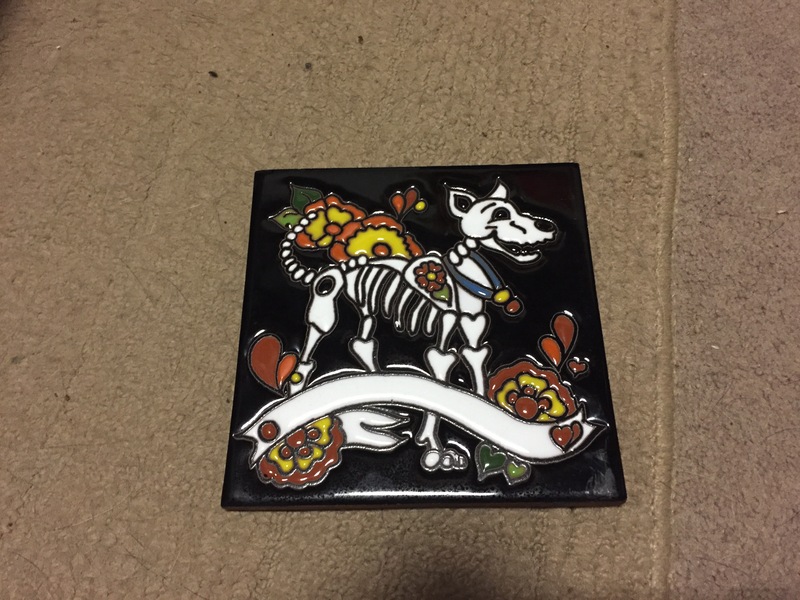 Then I bought a Day of the Dead ceramic tile; it’s a very happy dead dog. I bought it because it makes me laugh. Four days later , I drove away from City of Rocks without Misty. Someday soon, I’ll come back to our favorite place to scatter her ashes. 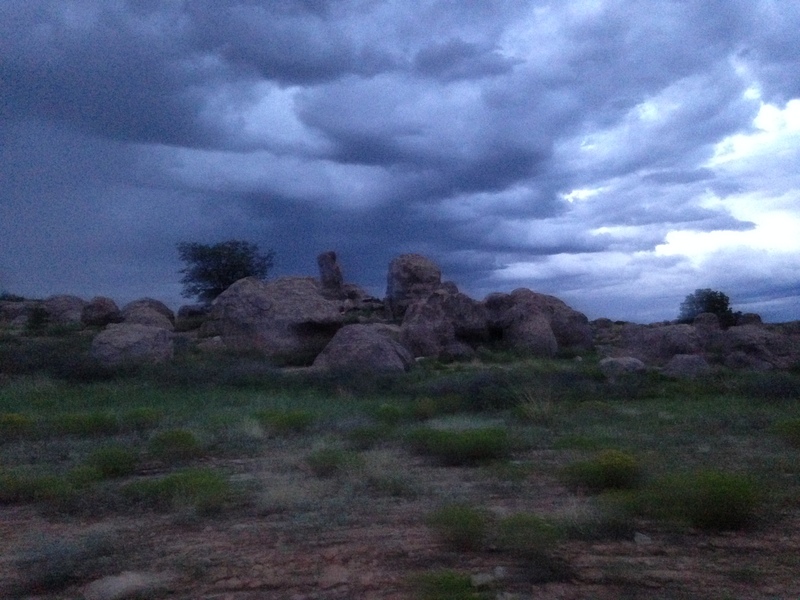 City of Rocks, where I found and lost Misty. In the meantime, I have outrageously colorful flowers on my table and a ceramic tile of a very happy dead dog. I believe Misty is happy – laughing over memories of olfactory heaven in a BBQ place, great last suppers, rabbits, coyotes, and even a last trip through Pet Smart. Misty wasn’t in pain. I still am. And she’s worth every tear. The mystery of love. You can only spend 14 out of 20 days in a NM state park. 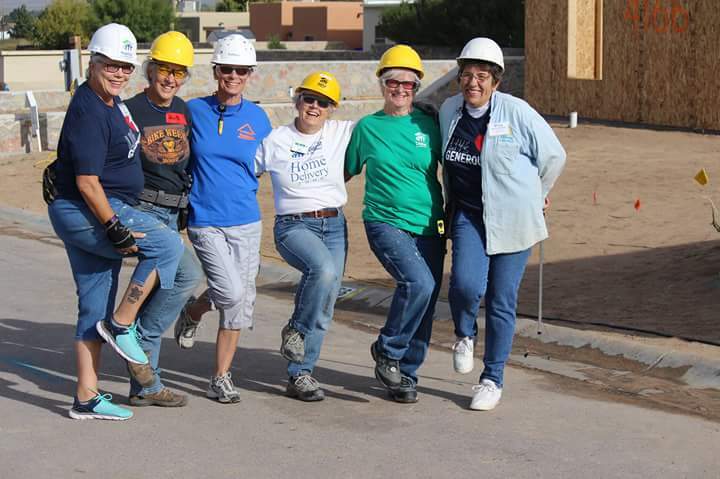 It was that time, so I hooked the truck to the back of the motor home and took a short ride from City of Rocks State Park to Las Cruces, NM to join the Care A Vanners, nine other RV’s parked at the Mesilla Valley Habitat for Humanity. Care A Vanners are a subculture of RV’ers who travel around the country with a purpose – to help Habitat build affordable, safe housing for strangers. Care A Vanners can be a strange group – generally, as in Las Cruces, it’s not a group of spring chickens but a group that, with few exceptions, qualify for senior discounts and Medicare. The exceptions in this group were Jake and Angela, a couple in their early 30’s who choose to spend the majority of the year volunteering for Habitat; they work nights and weekends to support themselves and then go home, to regroup financially, by working harder still. There was much cross-generational banner, and the young couple added a different flavor of levity to the group. As I said, Care A Vanners can be a strange group. And so this gaggle of mostly old people came together for ten days to pound nails. 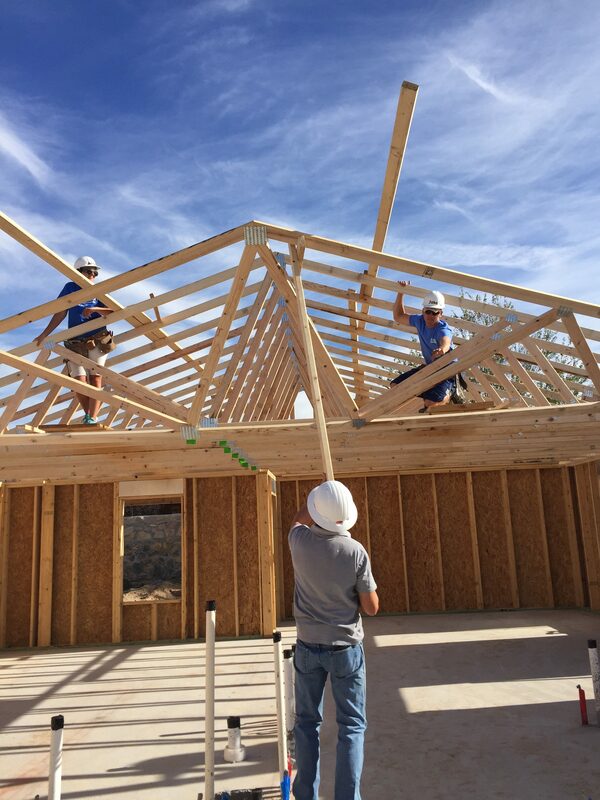 Forming a chorus line of limping, creaking, grunting, and stretching as we tried to work out charley horses, crunchy knees, bad backs, and blown shoulders, we worked HARD, framing, building walls, attaching sheathing, and lifting trusses. Jake and Angela, the youngest and strongest, volunteered on the roof. Many days the core group of Care A Vanners was joined by volunteers from the local community. 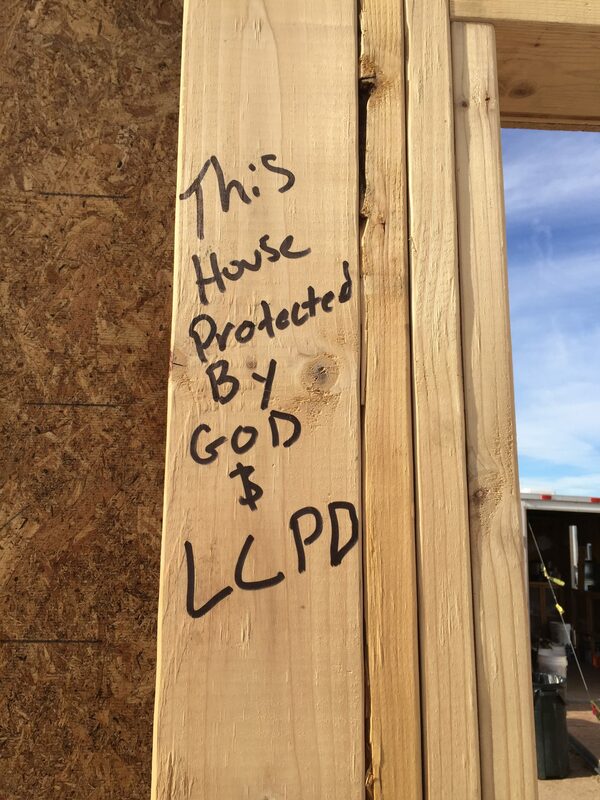 the officers with the Las Cruces Police Department were a big help. And, yes, we felt very safe! 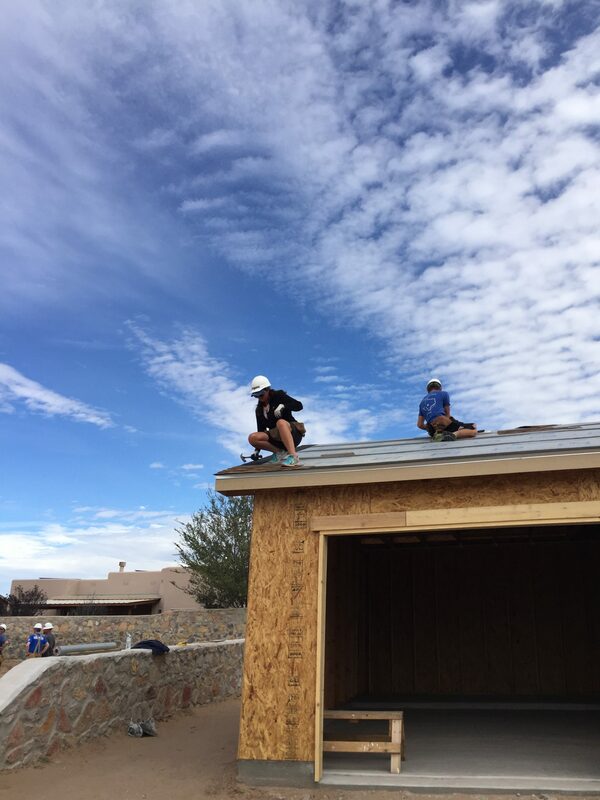 We also had the great privilege of working alongside several future home owners. What a joy to watch their eyes sparkle as they talked of how excited their kids are! 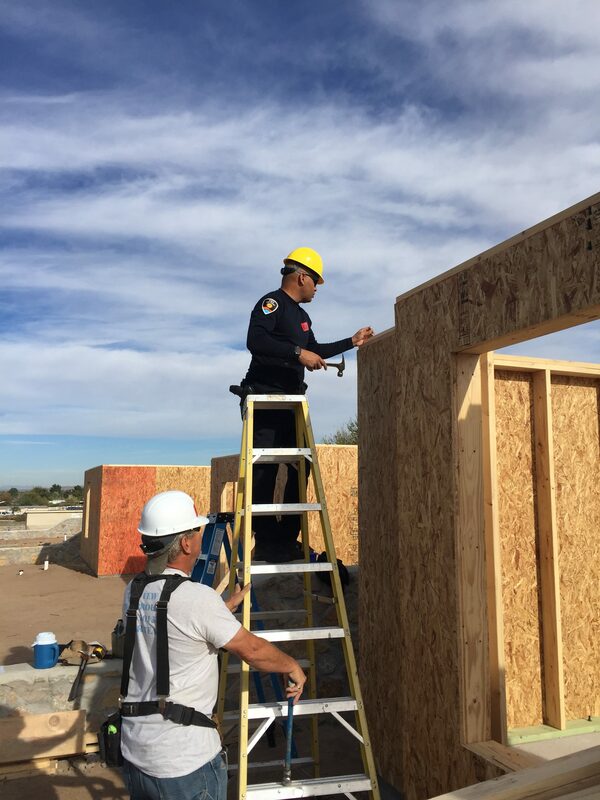 The houses Habitat is building are more than just decent housing – they are homes to be proud of, homes to raise children in. I hadn’t worked on a Habitat build in seven years, and something strange had happened. Now 70 years old, I’m somehow not as strong and don’t have as much stamina. What?? But my sudden onset of aging wasn’t obvious to the others; they were too busy dealing with their own. So we made bad jokes and took pride in the fact that though we were all given the senior discount without having to ask for it, we weren’t home watching TV, or sitting on a bar stool complaining. As the days went by, each of us hurt somewhere. My “some where’s” generally woke me up for a conversation during the middle of the night. Shooting pains across my upper right shoulder after a particularly long day of hammering, followed by red-hot pain between my right thumb and forefinger – right where I held the hammer. Ice, ibuprofen and wine seem to help. Collectively we went through almost as many ibuprofen as we did nails. a can can? Well, what do you expect when you give grey haired women hard hats and hammers? Pete helps out by adding his weight. Two men standing around, while a woman hammers. 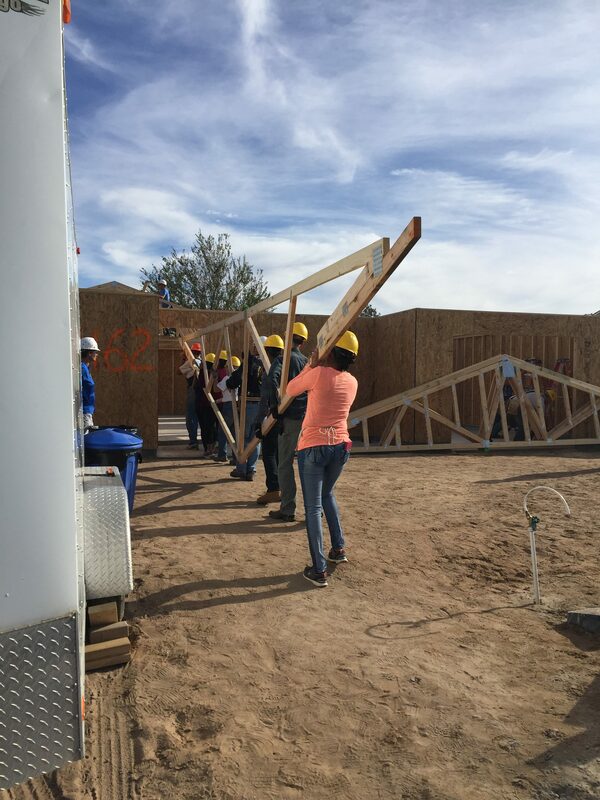 Mesilla Valley Habitat stresses excellent product (let me repeat – they were NOT shy about telling us to pull something apart and begin again), safety, and, yes, FUN. So there was much banter during the work day; those exchanges intensified as we sat around the camp fire after hours and were in high gear in the morning circle. Pete and Dyana were serious if not a bit fanatical about safety 😉 (everyone, always, had to wear a hard hat – period – no exceptions) Eye protection – but no gloves – when using a saw. I consistently added hearing protection to the litany of required safety items, but I’m not sure it was enough, given my significant hearing loss. I have an appointment with an audiologist this week; I hope to learn it’s a reasonable option for me to work other builds, with consistent use of hearing protection. Somehow manual labor – for such an important purpose – is very good for me. Good work with good people for a good cause. Some of these Care A Vanners will stay at Las Cruces until March. 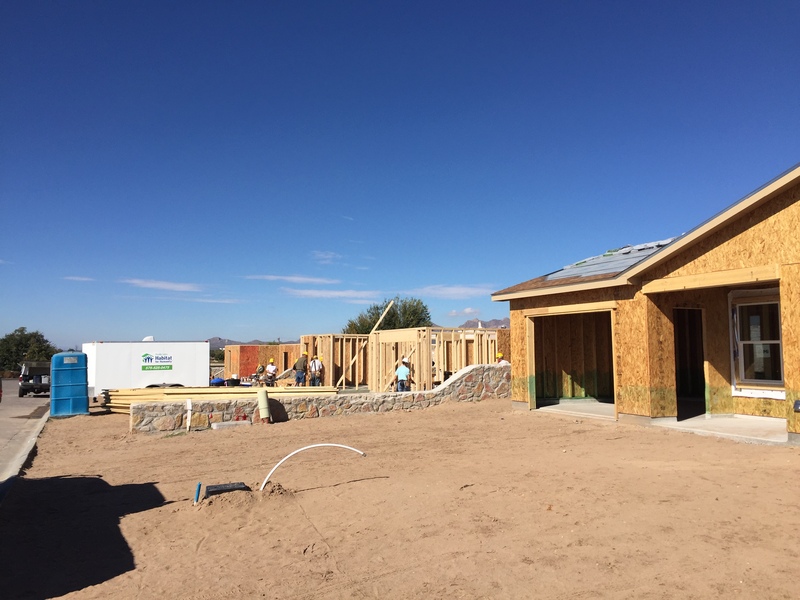 Others will move on, to see the country and aim their RV’s at another Habitat build. Often Care A Vanners provide the backbone (though admittedly an old, creaky bone) for home construction. 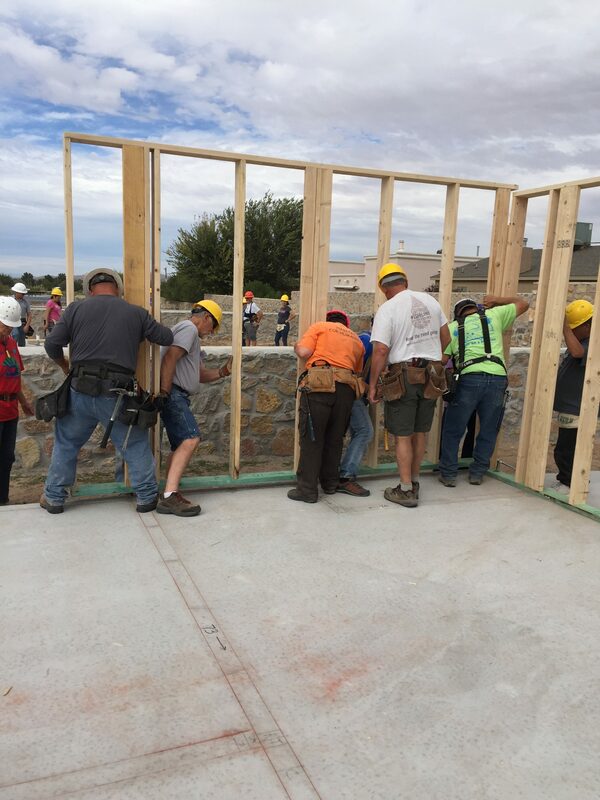 Mesilla Valley Habitat will build five houses this season, a goal that could not be realized without a cadre of aging gypsies who enjoy working and playing hard. Why did you leave the Bench, your role as a Judge? Why would you walk away from a secure position that paid very well, with incredible power and prestige? Before retirement age, long before the big benefits kicked in? You didn’t have to go! Why would you get rid of everything and ride around the country, alone, in an RV? Why don’t you go back? You can make good money doing mediations! When are you coming back to Florida? Where are you going next? Where will you be in February? Where are going when you leave here? “Why do you rope for short pay? “ Why do I prefer to ramble, observe and listen, instead of being fully engaged in the legal world? Maybe I’ve gone crazy out here. But it’s a good crazy. 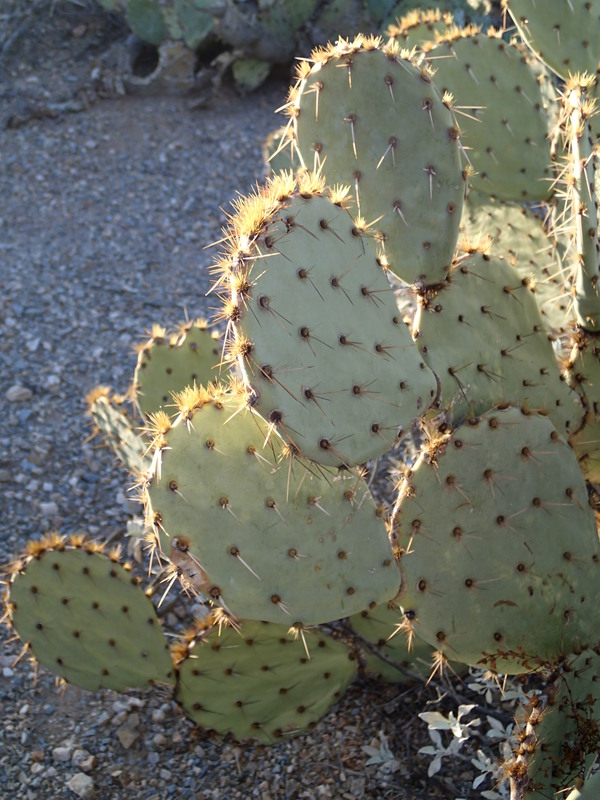 Sunshine to saunter in, in this forever-changing wide-open world of the high desert. A world in which I can see forever. Further than my eye can see. So from the mesa top, I look southward til my eyes get tired; then I like to pretend to mark that furthest spot. Take a break, then begin looking southward from there. Each morning I sit to watch the sun rise behind the mountains out the rear windows of my small motor home. The west side of the mountains is black/purple as the sky behind it begins to lighten. Soon above the mountain peak, there’s a subtle plume of blue in the orange/pink sky. Something like a cloud wisp in the cloudless sky. As the sky gets brighter with the sun inching closer to the edge, the blue/purple plume undulates slightly. It looks too magical to be real, but I can’t blink it away. Then the plume disappears as the sun pulls itself up over the mountain, throwing light daggers and quickly changing everything, But I have another appointment tomorrow, just before sunrise, to see that the plume reappears. Like me, Phil and Kathy are no spring chickens. They have seven grown children state-side, and they have lived primarily in the Mixtec region of Oaxaca, in southern Mexico for 17 years. They leave the U.S. in two days, going back to southern Mexico, near the Guatemala border. They will travel by bus. Not a big motor home or a chartered bus. They will take the ordinary bus that ordinary Mexicans use to travel across their country. Like the people they will travel with, Phil and Kathy are both ordinary and extraordinary. 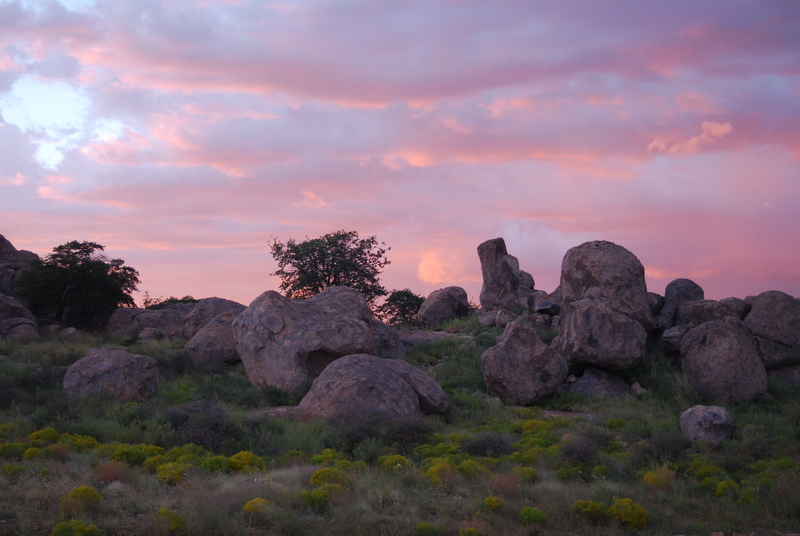 City of Rocks State Park is one of my favorites and I return here almost every year. 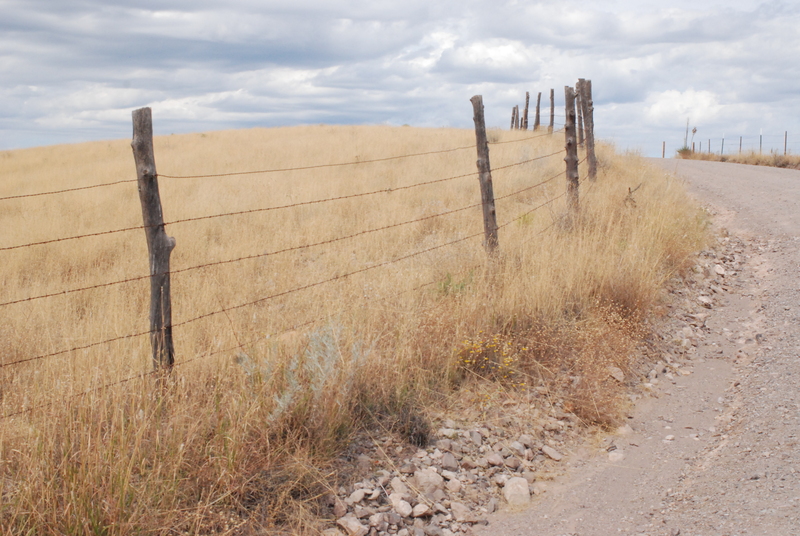 The views are varied – long vistas across rolling plains, punctuated by mountains. Nightly, there’s a jaw-dropping star party in the ink-black sky. 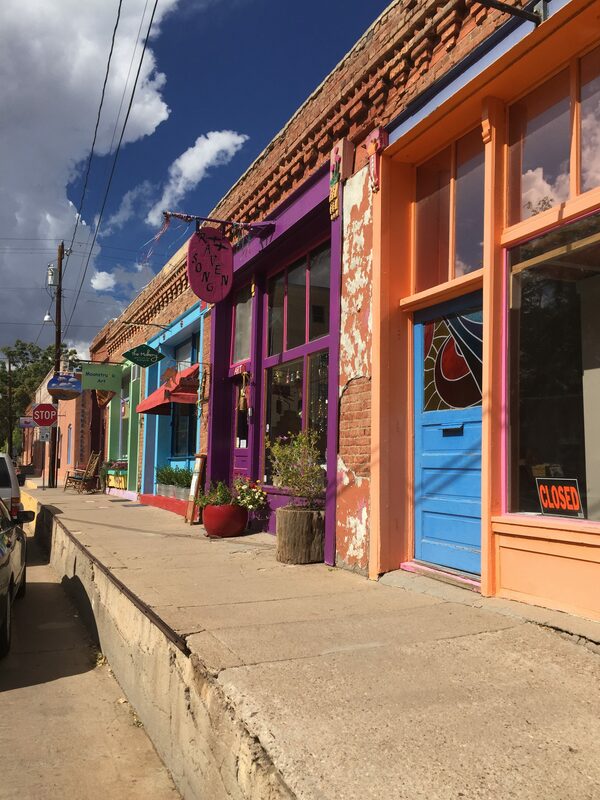 Silver City, a 45 minute drive to the north, is a fascinating, eclectic place with a wide range of people. I have close friends in the area. The Gila Cliff Dwellings can be a day’s outing. Yet as I sit in the quiet, writing, I hear rocks crunch under the tires of a lone truck heading out. The sounds of leaving piqued my interest – where are they going? My intrigue with the sound suggests I’m getting ready to go, too, to see what’s around the bend. OK, but – really, “Why do you rope for short pay?” Every day I speak with kind people and experience Mother Nature. Every day I have time to sit, without words, and look out the window. I write and most days I take a nap. Misty and I spend time outside, exploring. Yes — expensive things break, I get stranded, I get lost. Some days I get down on myself for not “accomplishing” something. Yet life is good, people are kind, and Nature is awe-inspiring. 13. Beginning again – again. Somehow, I get tangled up when I cross back to the Adult World, and things take much longer than I plan. So it was that my short time planned in NW Florida turned into a long time, full of responsible adult things. But, after sifting and shifting minutia I was finally able to get back on the road. And again, I find myself, leaving to be me. A sojourner, a gypsy, a lover of open roads. 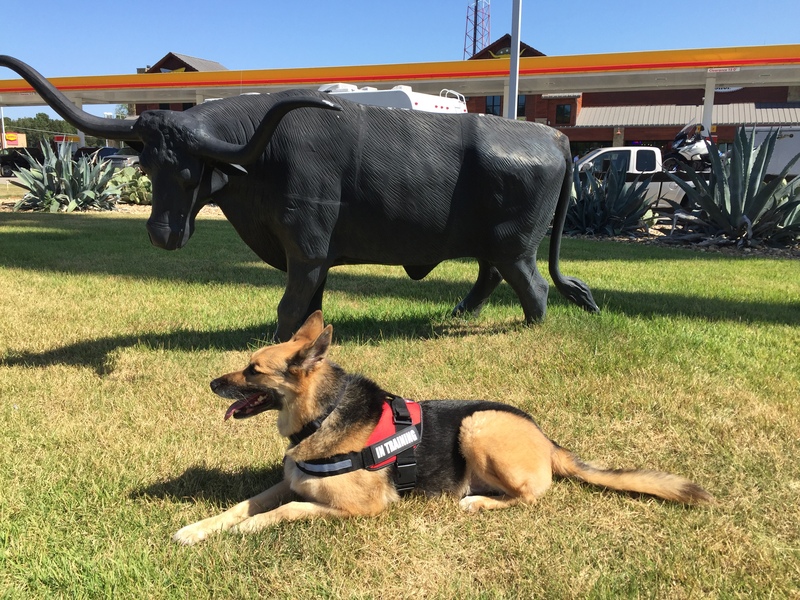 Misty (my German Shepherd) and I drove the motor home with the truck in tow and motorcycle in the bed for 1,200 miles to New Mexico and spent nights with Wal-Mart to offset the startlingly high cost of gas. I tried a new approach – driving only 300 miles a day, rather than the 400+ I always drove before. It was less tiring, but still a very long way. In route, I conducted a scientific experiment and determined I do not enjoy a 4,000+ foot decrease in altitude, going down the mountain from Cloudcroft to Alamogordo, NM. Nothing bad happened, but it was not fun. 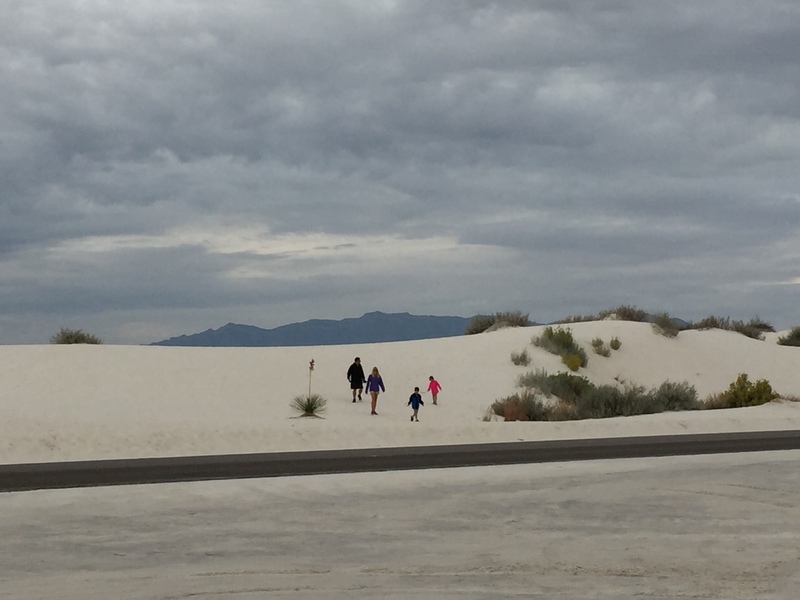 Stopped in at White Sands National Monument for a photo op, and then began a tour of some of my favorite NM State Parks. Though this looks like the beach along the Gulf of Mexico, it’s the desert. See the mountains in the background? After almost a week in one place, I’m settling in, settling down. And I’ll leave again soon. That’s what gypsies do. I love the high desert, the low humidity, the plateaus, the mountains. The changing light, the varied bird sounds, star-gazing without city lights. Early this morning, I heard coyotes singing themselves home from a hunt. It was the closest, loudest and longest song I’ve heard, from what seemed like several dozen coyotes. It was happy magic. 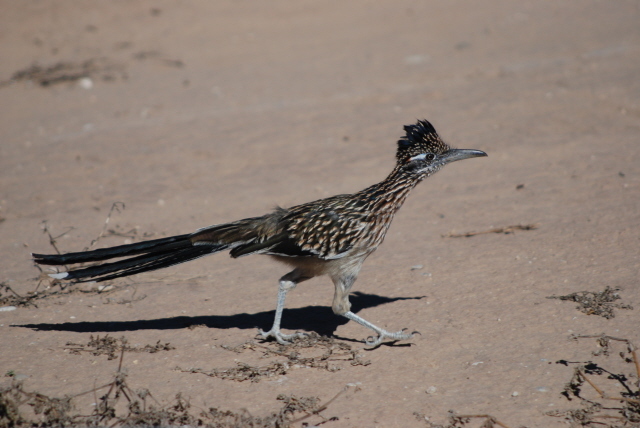 Yesterday I was at the kitchen sink when a LARGE roadrunner landed on the water facet outside the window. He left as I picked up my camera. Like the coyote songs, the roadrunner image is only recorded in my heart. I’ve begun to play with my camera – a good measure of my contentment. I took a hike above the Mimbres Valley with my friend, Marion, today, and share a couple of pictures from that outing. It’s been a long time since I’ve written —the cast of “reasons” is legion and irrelevant. Today, I begin again. Today, my photos won’t transfer to my PC. But I begin again, with photos to come later. 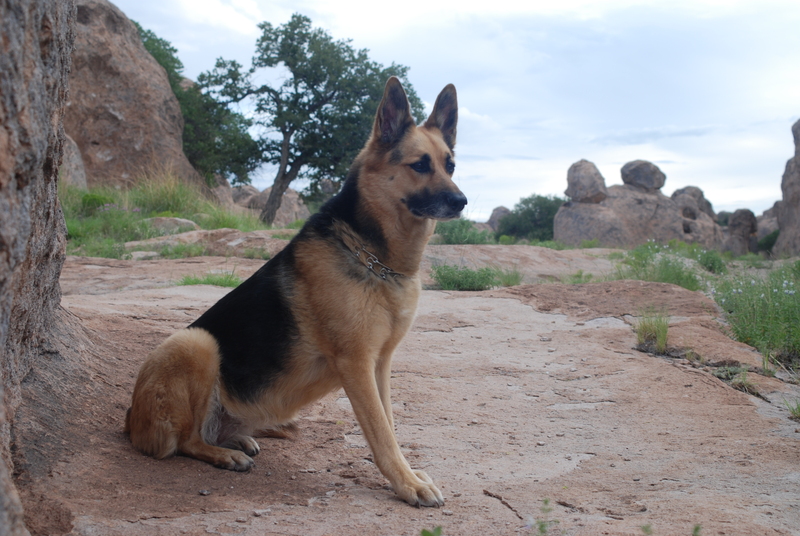 I’m at a RV park in southeastern Arizona – in a 27.5 foot Lazy Daze motorhome, with my German Shepherd, Misty. I’ve had some health/aging issues, and in my best imitation of a responsible adult, I’ve downsized and even left my motorcycle in Florida. I’ll go back to Florida in May for a month or so; after lots of PT and expensive tests, I’ve been cleared to ride again. Whew! 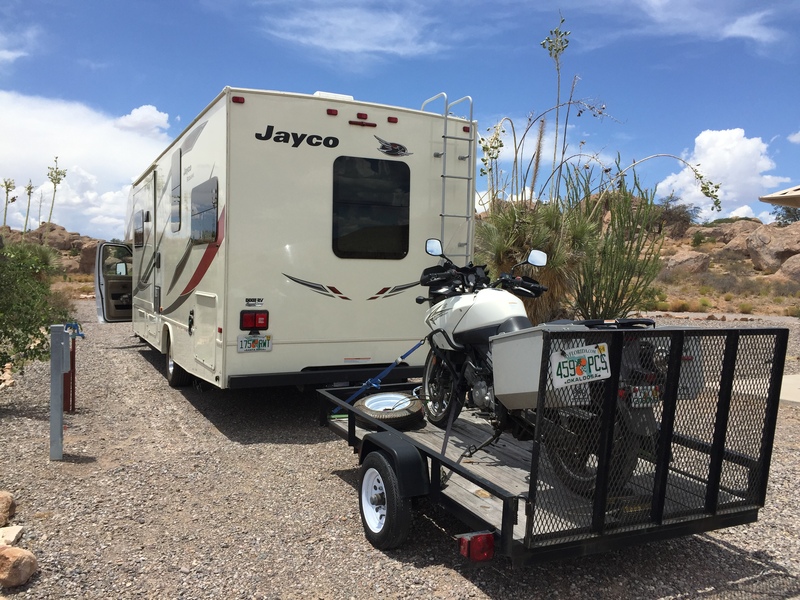 And before it gets impossibly hot and humid in Florida, I’ll head to the mountains of the West; the bike will be riding in the bed of my truck, which I’ll tow with the motorhome. And when I stop, I’ll unload the bike to ride. 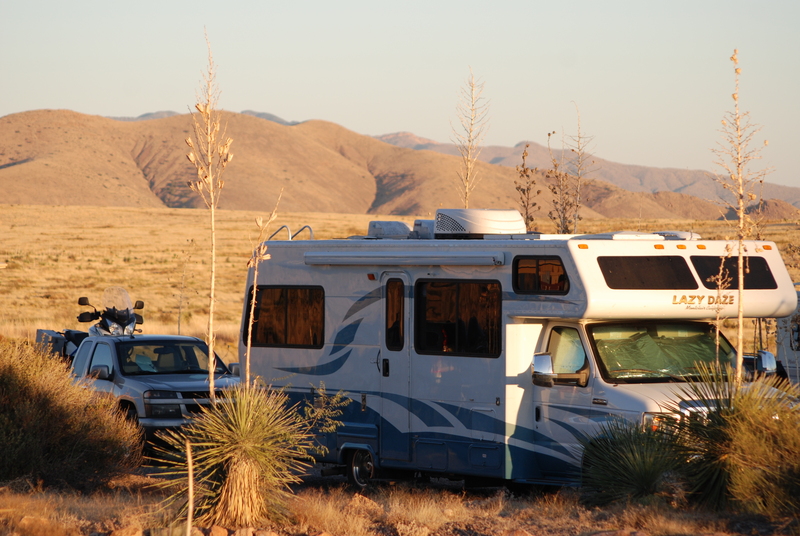 There are untold numbers of RV parks in Arizona, a testament to the sub-culture of motorized gypsies moving around our country, often under the radar of main-stream awareness. 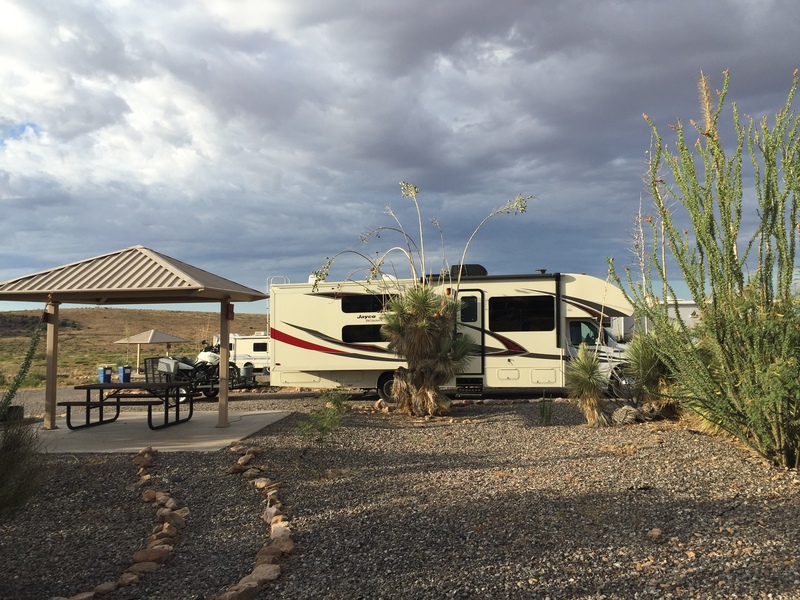 In the world of Arizona RV parks, this one is neither large or small; it has about 360 lots and there are no vacancies. I’m one of many who are renting a spot; others have bought a life-time lease and spend as much of the year as they choose on their lot with a casita (“little house”, in Spanish). The casitas are as eclectic as this group of aging nomads. Winter is the peak season, so lots of Snow Birds are here. Though they had a major blizzard in the Northeast last week, in SE Arizona the high today will be 87, the low tonight 54. There’s not a cloud in the sky, and the wind is 4 MPH. Humidity is 13%. It’s warming up rapidly as the sun climbs over the mountains and marches high over the desert. 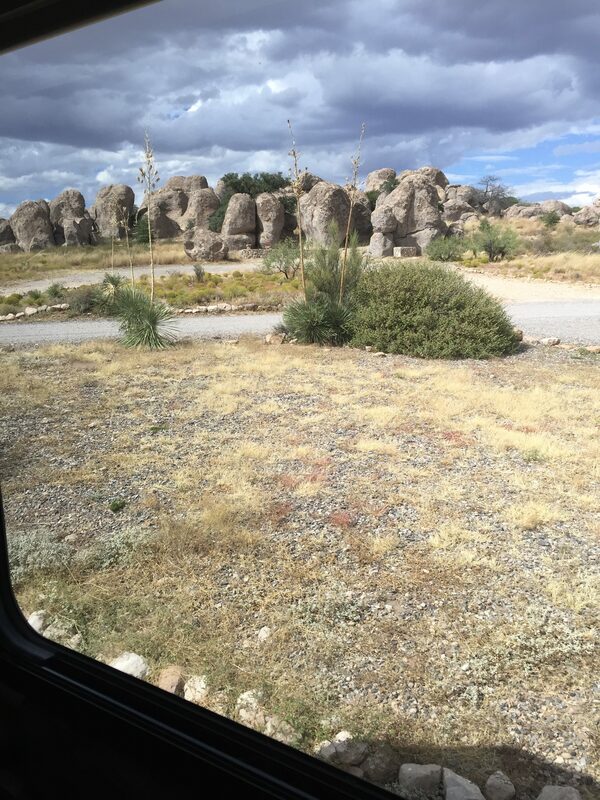 When I look east, out the window of my motorhome, I see mountains off in the distance with miles and miles of desert in between. When the sun goes down behind me, those mountains come to life in the afterglow. To the west of the park, the desert goes on and on and on. It’s open to hiking, biking, and off-roading vehicles. I heard you can walk through the desert about 2 or 3 miles to breakfast in town; I haven’t done that, yet. You can’t see town from the paths I’ve been on; someone promised to show me the way. Apparently you climb down a side arroyo and then wander north a bit. I love the stark beauty of this high desert (we’re at 3,600 feet). Last night the train was blowing its whistle as it passed through the small town (Amtrak comes through here), and the coyotes began to answer – like dogs in town talking back to a siren. The Gambel quail are everywhere in the park, scurrying across the rocks with what looks like an ever-so-tiny parasol bobbing over their heads. There are lots of doves, cooing from above. I’ve seen a few hawks and pyrrhuloxia (the first cousin cowboy of the cardinal). I haven’t yet gone on a specific birding hike but will soon. Having lived my life in Florida here are some desert rules I’m learning: ALWAYS walk after dark with a flash light, even if the moon is full (rattlesnakes like to keep warm after dark on the dark asphalt). Don’t hike in the desert in tennis shoes. The ground is crumbly, the terrain uneven, and the rocks hurt your feet through those flimsy soles. 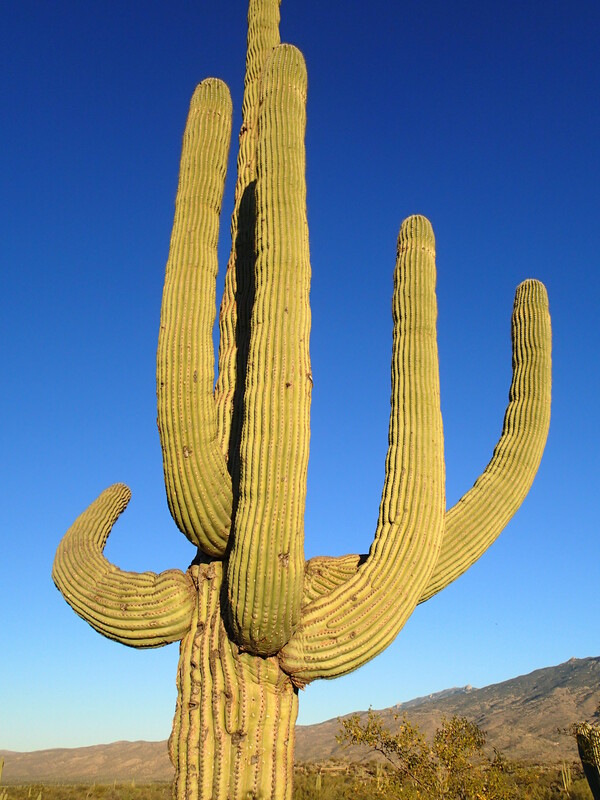 And that trendy footwear won’t even slow down the desert thorns designed to slice and dice. ALWAYS wear a hat and sunglasses with lots of sunscreen between sunrise and sunset. 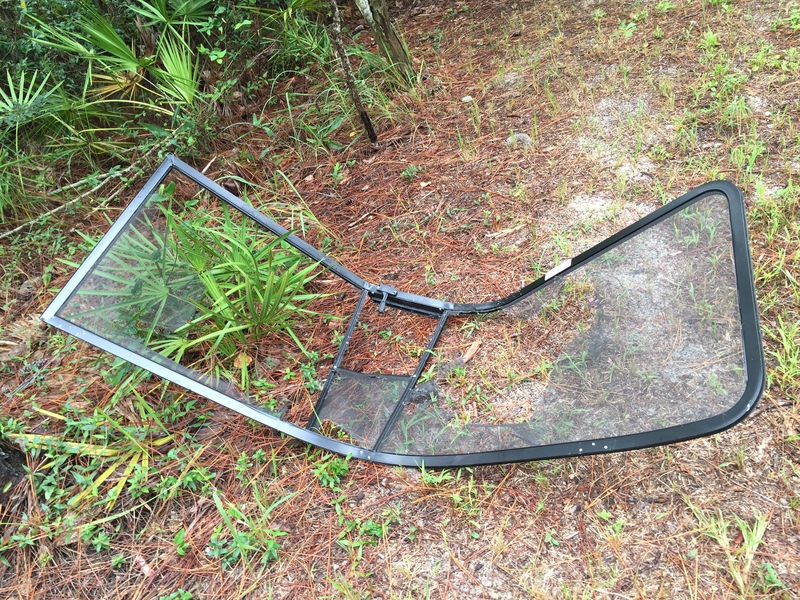 Don’t ever go off for the day and leave the awning on your RV out – the winds can do amazing things, rapidly. A dust devil is like a pint-sized hurricane without the water or tree limbs. And don’t forget your water bottle. As I struggle to deal with the many faces of the unleashed hatred following Trump’s election – including but not limited to bigotry, misogyny, racism, homophobia, Islamophobia I’m reminded of how I’ve been taught to handle curves on my motorcycle. OK, those of you who do not ride may think I’m straining for this analogy but bear with me. In single vehicle crashes, more bikers are killed in curves than any other scenario. The biker fails to negotiate the curve and runs off the cliff, into the guard rail, the mail box, etc. And dies. Basically, the biker looks at what he’s afraid of, at what he doesn’t want to hit, or what he suddenly finds fascinating, and wham! It’s over. 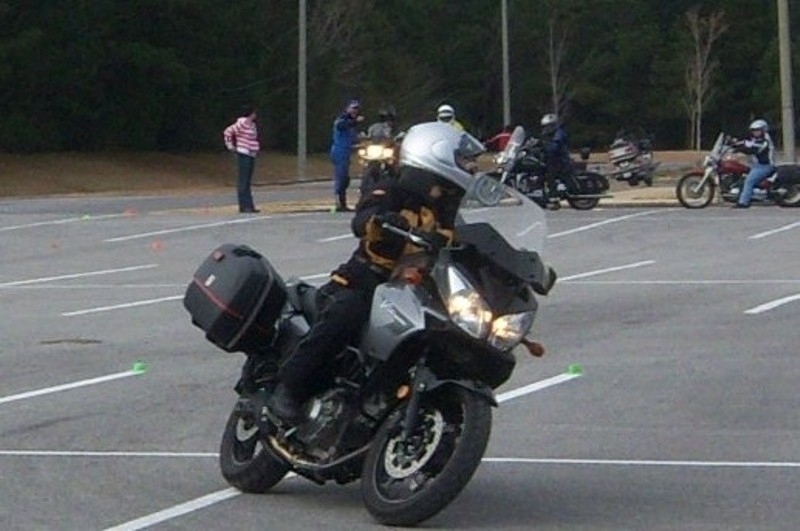 The Motorcycle Safety Foundation stresses the proper technique for handling a curve. One shorthand version of the lesson is – slow, look, press, and roll. Slow down to an appropriate entry speed. (Get on the brakes – don’t try to go into the curve at a break-neck speed) Look through the curve, look where you want to go. (Do NOT look where you do not want to go. Yes, the cliff is right there, with no guard rails and the edge of the pavement is crumbly. But don’t look at it! You are going to go where you look. Head and eyes up – Look through the curve, look where you want to go) Press – lean into the curve. (You’re at the curve now and there’s no more time. Lean into it. Commit yourself. ) And roll on the throttle – speed up. (Yep – speed up. If you brake in the curve, the front end of your bike will dive, you’ll lose traction, and you may well die. Speed up and you will be stable). You can stop and change your pants when you’re safely on the straight away – but there is no time to be tentative on this side of the curve. Sometimes I see a curve coming and have no trouble slowing. Other times I find myself going too fast and have to really get on the brakes. That’s where I am right now, watching what feels like the unleashed worse, emboldened to act and threaten our connected humanity, and it’s closing fast. I’ve needed to really get on the brakes. I can’t see how to handle what’s coming next, but I can remember what to focus on. Side note – for those familiar with the Myers Briggs Personality Inventory Test, I’m an INFP. I’ve been in tears with my heart racing as I seriously slow down and reassess pretty much everything. Others respond with anger, by sulking, or analyzing, We each do the best we can. For me, the fear is not of a change, or lack of change, in politics. The fear is for our humanity in the face of the legitimization of hatred, bigotry, homophobia, misogyny, racism, Islamophobia . My fear is We, The People, may just surrender and placidly follow the roads being drawn that lead to divisiveness. My fear is we will focus on the negative, the hatred, and become part of it. Like a biker becoming part of a guard rail. Things are going to change rapidly around this blind curve in our shared road. Right now, I need to slow down and keep my head and eyes up – focused on what I value, where I want to go. I refuse to lose control and fly over the cliff or crash into the guard rail. I refuse to let hatred trump love. Love is bigger and better than that. American is better than that. It’s mid-September & I’m still here – at the moment here is a delightful RV park in Baldwin County, in southeast Alabama. And it feels like I’m the ping pong ball in a swift moving challenge between two mean spirited mechanical gremlins. The game began a couple of weeks ago when I drove the motor home into my son’s subdivision (remember I had only the motor home and motorcycle – no car). I turned too sharp – my bad – and hit the curb. The same curb about a million others had hit, breaking large chunks of cement and exposing the ends of multiple pieces of rebar, one of which gave me a side-wall puncture about 6 inches from the ground. My son rattled off the names of several people – including my son – who had been skewered on that rebar. A mere $409 later, the wrecker was gone & I could leave, too. 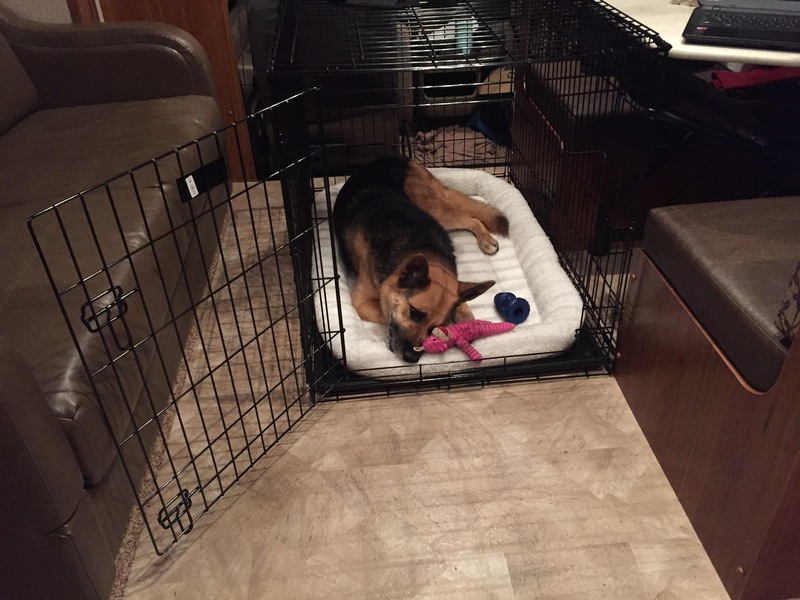 I was fostering a small dog in the motor home; my German Shepherd Misty was tolerate but obviously preferred being an only child. I had parked the RV under some oak and pine trees, near Blackwater Bay. While I was riding, a nasty thunderstorm blew in. Living in a motor home is something like living in an igloo ice chest; the noise of a pine cones and acorns hitting the roof takes on new dimensions and heavy rain sounds like castanets. Now, Misty, aged 10, had lived only in the desert before she came to live with me in June, 2015 and we’ve enjoyed a lot of time in the desert. In her defense – and she was certainly going to need some defense – she didn’t know much about life in an ice chest in the fierce summer thunder storms of Florida. The insult of being left alone with a fluffy white dog princess only slightly larger than her dinner plate was too much when that storm rolled in – Misty freaked out. She ate the backup camera, both sun visors, and the windshield wiper knob; she decided the screen door needed no screen and would work better shaped like a chaise lounge. Jeff W, my Geico claims adjuster, has been great — no bad jokes and he even assured me he had seen worse. After my $500 deductible, they’ll cover the rest of the $1,200 in damage. The little dog has gone home. who needs to go backwards? The vet recommended Prozac. As Misty and I were in route to pick up her meds and newly delivered crate, a man pulled up beside me at a stop light and said, “Do you know your steps are out? “ Seems that the electronic monitor that automatically retracts the steps when you start the engine was attached to the chaise lounge, formerly known as a screen door, lying back under the pine trees by the water. Good news is – I didn’t take anyone out at the knees or rip the steps off on a curve. I went back to the Bay, afraid to drive further but not afraid to ask a friend to deliver Misty’s meds. And then we waited for the Prozac to kick in. BTW – Misty first thought the heavy metal crate was an interesting bed or cave, but she obviously never intended to be locked in it, alone, during a storm. I left on my bike, in need of some road therapy, relieved she and the motor home were safe, but a storm blew in so she let herself out by bending the door, leaving blood behind to prove her point. Now the folded crate sits on its edge, an effective roadblock so she can’t get into the cab. Neither can I. Three days later, I called the vet’s office because Misty was still swinging from the rafters, so to speak. THEN they said it could take three weeks to see any improvement, so we went to town in the motor home to get her a sedative. 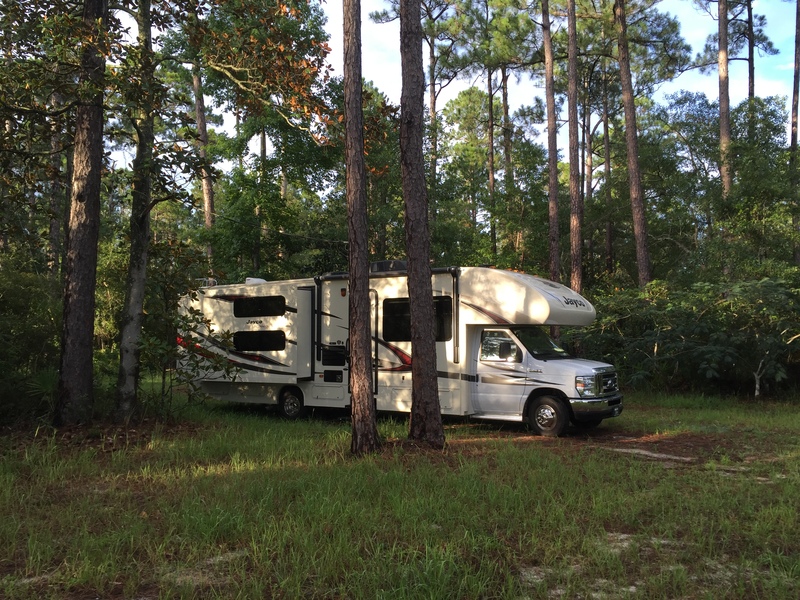 And decided to move to this lovely RV Park in Baldwin County, Alabama, where I’m parked in the open – no pine cones or acorns here! She is much better, and I’m cutting back on her meds. She hasn’t eaten any more motor home parts, and we talk about going back to the desert, where there are no trees and it seldom rains. It’s important to remember, as you read my whine, that I’m by myself, I know no one in this RV park, and I don’t have a mechanical bone in my body. So – I decided I needed to buy a truck for my dog. This idea of driving the motor home when Misty needs to go to the vet, or when the weather is – or may get – bad – well, it’s just too much. So I did tons of research and identified a truck that is not too heavy, that will flat tow behind the motorhome and hold my motorcycle. I found a good one on-line – arranged a pre-purchase inspection, and am now the proud owner of a 2009 Chevy Colorado extended cab, 4WD, automatic (all required to flat tow) But the gremlins were still restless. 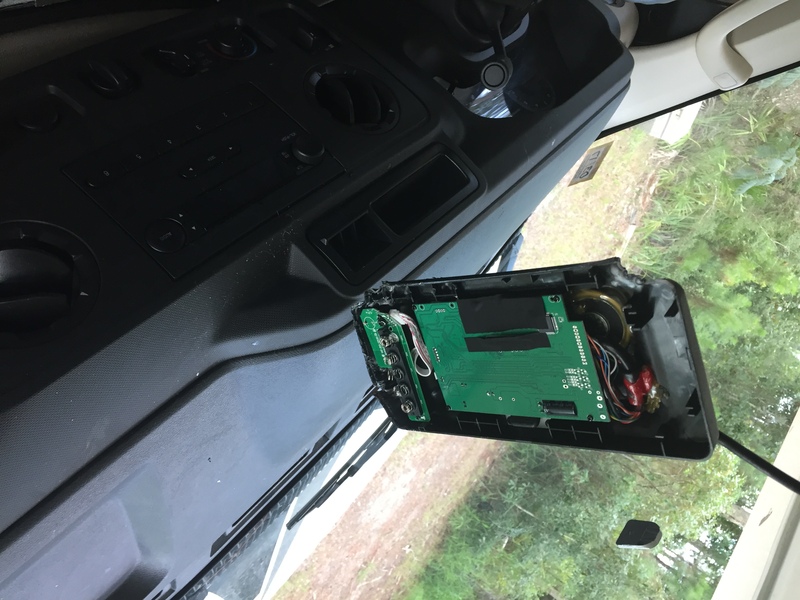 Next the mechanical gremlins tried to trash my truck. I bought it on Wednesday. On Saturday, water began pouring from under the dash on the passenger side; then as I drove back to the RV after dark, down a narrow country road – my head lights went out. I turned the knob and they came back on, on bright. Only on bright. Several people on that quiet road seemed irritated with me, but there was nothing I could do but trudge on. Several lights on the instrument panel came on. No choice but keep going. Then Sunday morning, the truck wouldn’t crank. By that point, I was doing my best impersonation of a rational adult, but it wasn’t pretty. Monday morning, while the RV tech was changing out the hot water heater, the wrecker came for the truck. Of course, when the burly wrecker man turned the ignition, the damn thing started right up. I said, “I don’t care. Load it up and take it to the shop!” And so he did. The truck repairs were a mere $500. The positive post on the battery had broken; the vents to the AC were stopped up; the fuel sensor was bad. It’s still the truck I want. In 10 days I have an appointment to have the slide removed on the motor home so they can repair the flooring. The following day, I’ll take it in for repair of the dog damage. I’m still satisfied with the motor home. And Misty is still the dog I want. OK – the rational adult in me says — it could be much worse. I could be a mother with children in Syria. I could have lost everything in the recent flooding in Louisiana. I haven’t been attacked by a shark or mauled by a lion, but I’m tired of dealing with these mechanical gremlins. They are not life altering but about as much fun as a siege of fire ants. 9.I’m not sure why my back hurts. 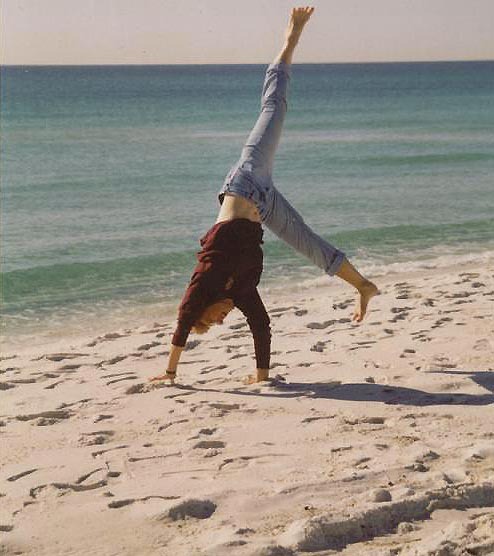 In early June, as I was getting ready to head West, I was suddenly grounded in NW Florida with serious back pain – bad enough I had to postpone my road trip. Because if I took off, I knew I might get only half way across Texas. And I didn’t want to be stuck in Texas, especially in the summer. Not alone, with miserable back pain. Me – “I’m not sure. Maybe it was 69 birthdays, 600 skydives, over 100,000 miles on a motorcycle, some of which was off-road and a deer in the Rockies who totaled one of my favorite rides. All well-seasoned with large doses of stubborn. Do you think that may have done it?” The doctor didn’t even smile as she ordered a bunch of tests, and I began to reassess what really matters to me. I’ve grown somewhat accustomed to the lines and droops I see on my body, but I was deeply offended to see on the MRI & X-rays that even my insides are OLD. Damn! So now what? Well, I do not have to drive a 4×4 dually diesel pickup; I don’t have to wrestle with a travel trailer or a motorcycle lift to get my bike into the back of that big truck. But I REALLY do need to travel. And I’m NOT ready to give up my motorcycle. So I traded in my beloved Arctic Fox travel trailer and Chevy 3500 diesel truck for a setup that an aging gypsy can handle – a 31 foot Class C motor home by Jayco. And to my amazement, my back is so much better now that I’m not climbing into and out of the cab or bed of that tall truck. Right now, I’m back in Northwest Florida in August – they’ve had 48 inches of rain this year; 8 inches in the first 15 days of the month. I’ve ordered new rain gear. Today I rode into town in a misty rain. It felt good – fun — like walking in mud puddles. When the rain is horizontal or the lightning strikes make me duck and cuss, I sit it out. I have large bags or panniers on the side of my bike. Tacky friends refer to them as my metal filing cabinets. Call them what you may, I can carry groceries though I do keep an eye on the volume. 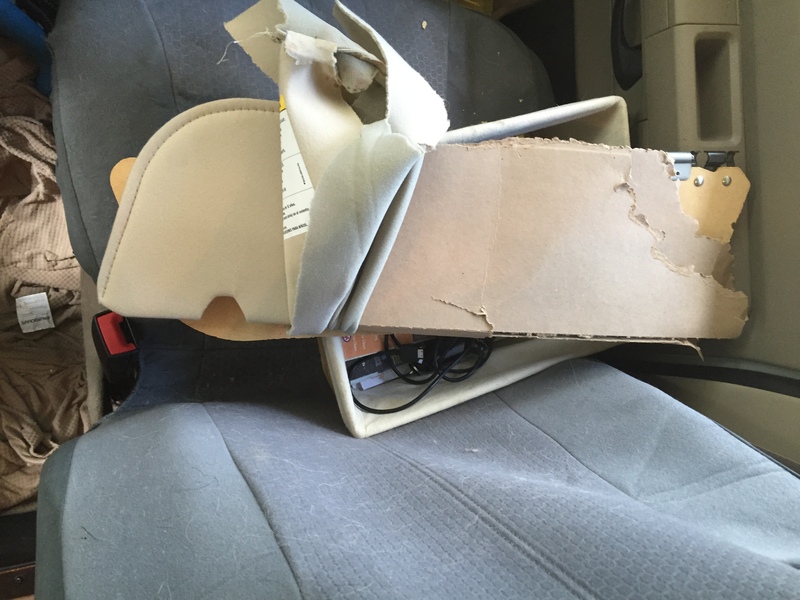 I have a cargo net that secures boxed wine to the rear seat but crushes potato chips. I don’t have a washer/dryer in the motor home, so I’m learning to not let the laundry pile up. I go the Laundromat on the bike, with clothes in the side bags and strapped to the back seat if needed. They come back to the motor home clean and seriously compressed. So far, my attitude and patience are intact. I’d like to be able to buy an enclosed cargo trailer for the bike, but I may abandon this plan and get another truck – pull the truck with the motor home and put the bike in the back of the truck. As soon as my back pain tapped down a little, I left in the motor home with my German Shepherd, Misty, pulling the bike on the open trailer. But then after only a couple of weeks out West, a much-loved friend became critically ill, and I turned the motor home back to the East. Sadly, Hilda died. I’m staying around a little while to help Tom, with an eye on the road and maps. Have you noticed how many thin lines there are in life? Today, I’m feeling the very thin line between strength and vulnerability. I love to ride my motorcycle – down winding roads, over mountains, across deserts, along the coast. Following that yellow brick road known as the center line. The line is not very wide. On the 4th of July several years ago, I was happily riding my Yamaha FJR in the mountains north of Durango, Colorado. Feeling strong, confident. Until I rounded a curve and saw a herd of mule deer milling around in the on-coming lane just across that double yellow line. FYI mule deer are huge, weighing 200 to 250 pounds, compared to their spindly Southern cousins known as white-tailed deer who weigh a mere 100+ pounds. And when you rapidly approach a mule deer on a motorcycle, they grow bigger, fast. I got on the brakes hard and had a fleeting image of getting safely by these deer whose heads were higher than mine. But one of them bolted, and in a Nano-second I was down with my left shoulder on that double yellow line. I’m a flat-lander from Florida, but I understood immediately that it’s never a good idea to lie down on a double yellow line in the mountains. So, though part of my rational brain said I shouldn’t move in case I had spinal injury, my louder, animal brain screamed “Get outta the road!” And so I sprinted – straight to the narrow, grassy strip that capped one of the many steep cliffs in the area. Then, I sat down. Just in case I was hurt. The bike went on down the road about 30 feet without me and then did a 180. Neither the bike nor I were where we belonged. I was glad to be out of the road and that my bike hadn’t launched over the edge. That would have made for a really bad day. I had T-boned a very healthy mule deer; he got his hooves caught under my front fender and kicked loose, dropping me and the bike. At that point the deer was nowhere in sight. But honestly, at that point I wasn’t worrying about deer. My shoulder, knee, and wrist hurt and I didn’t know about my bike. I didn’t realize how much traffic was on that road, until I stopped it with my quick dismount. Several people got out of their cars or trucks to help. I asked some guys to pick up my bike and point it with the traffic (I didn’t relish having to do a tight U-turn at that moment.) The FJR was gouged and bent in places but appeared to be functional. I was pleased to find that my left arm and leg still worked, though seriously stunned and stiff. So, I got back on my bike and rode it to my RV, about 10 miles away, with my left leg straight, using it and my left arm only when essential. I was leaving the RV Park the next morning, so I loaded the bike, hooked up the trailer, and headed south. But when I unloaded the bike, releasing the pressure of the tie-down straps, things didn’t look so good. Short version – I had some impressive road rash on my left knee and shoulder – leaving enough permanent scars to qualify as bragging rights and a gimpy left shoulder. I learned to not wear a cuff bracelet while riding (it gouged my wrist, leaving a big knot). The insurance company totaled by bike. I cried when they loaded it up on the wrecker. And several years later, I’m still reminded of lines. Lines that can delineate my vulnerability; lines that separate the past from the present. Lines on my face as I somehow have aged beyond recognition. The moving line between what I could once do without a thought, but now??? Maybe I better slow down and look at it before I launch.